This article briefly presents I2P Darknet and explains why it is a good option for hiding your IP address while sending an email or downloading torrents. I2P is a vast anonymizing network, similar to Tor, with some distinct differences. The I2P network is often used as the backbone of a part of the Darknet (or Dark Web). The Dark Web is defined as a small portion of the Internet that has been intentionally hidden and is inaccessible through standard web browsers. The Invisible Internet Project (I2P) was launched in 2003 as an anonymizing network focused on securing the internal connections between users. By connecting to the I2P a device or computer becomes part of a distributed and decentralized network that allows secure and anonymous communications. As a side effect, I2P bypasses filters and governmental restrictions. I2P is designed such that users can communicate with each other anonymously, meaning that both sender and recipient are unidentifiable to each other as well as to third parties. The communication is message-oriented. Each message is encrypted and passed through several network nodes from the source to the destination. The exact mechanism is not exactly easy to understand, by the following I2P infographic may help. The I2P Darknet network uses a significant number of cryptographic techniques and algorithms, including 2048bit ElGamal encryption and 256bit AES in CBC mode with PKCS#5 padding. This is important for the security and anonymity of the messages sent through the network. As they are passed through several nodes, they need to be strongly encrypted. What can you do with I2P? This is probably the thing you are most interested in. Yes, it may hide your IP address while browsing the Internet, but there are other more specific tasks you may perform. Using the I2PTunnel application, it is possible to stream TCP/IP applications over I2P, such as SSH, IRC, a squid proxy, and even streaming audio. Most people do not use I2P directly. The I2P enabled apps are the way to go. You may find below the most common uses for the I2P network. 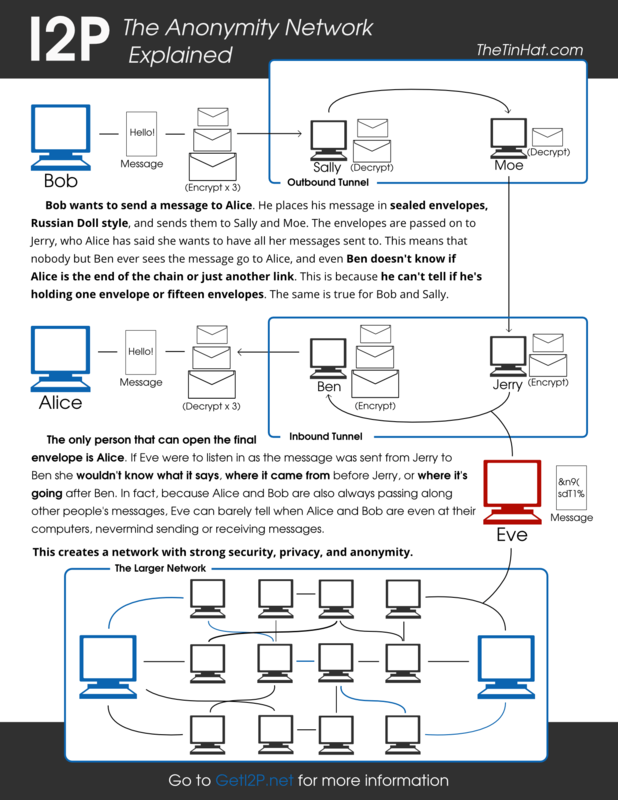 Email/Messaging – This is the main reason for building I2P: sending messages in total privacy and anonymity. There are a few messaging services on I2P. The built-in mail application lets you email the regular internet to, and from I2P. IRC (Internet Relay Chat) – The I2P is the perfect manifestation of the freedom of speech. If you end up using I2P, you should check out the IRC. Eepsites – Eepsites are websites hosted on the I2P network, whose operators can be anonymous. Like hidden services, these sites cannot be accessed from outside the I2P network. Their web addresses are actually readable, with the domain of .i2p at the end. Torrents – I2P has the Postman Tracker and I2PSnark. The tracker is essentially the Pirate Bay, and I2PSnark is essentially uTorrent. By using I2P, torrenting is secure and anonymous. How to install I2P? I2P Tutorial. 1. The first step is to download and install Java as I2P is written in the Java programming language. It is possible that you already have this on your computer, but if not, then download the latest version and install it. 2. Next, download the I2P installer. A console window will open. It shows the installation log. 3. A browser window will open on the I2P Router Console page to let you know that you have connected successfully to the IP2 network. You may initially have to wait a few minutes while the software finds peers and connects tunnels to them. 4. Next, the Router Console will show that you are fully connected. Check the Manual proxy configuration box and enter the following values: HTTP Proxy: 127.0.0.1, Port: 4444. Also add localhost, 127.0.0.1 to the No Proxy for the box. 6. Welcome to the I2P darknet! You may now access the Dark Web and I2P websites that have the .i2p suffix. Enter the address of any eepSite. A good place to start finding interesting eepSites is the eepsite.com search engine. A lot more info (including info on configuring firewall ports) is available on the I2P Darknet site. Is I2P better than Tor? What are the differences between the two networks? Let’s find out. I2P is able to put multiple messages into one encrypted packet (Garlic routing), making it harder for an outside observer to find out what’s going on. Unlike the Tor network, which uses a centralized directory to manage the network, I2P uses a distributed peer-to-peer model. I2P uses packet switching instead of Tor’s circuit switching, which means transparent load balancing of messages across multiple peers. Unlike Tor, I2P tunnels are uni-directional, so incoming traffic and outgoing traffic are completely separate, which improves anonymity. I2Ps uses its own API rather than SOCKS which is used by the Tor network. This helps to make I2P more secure than Tor. I2P is much faster than using Tor, more secure, and more robust. Thus, we may say that, yes, I2P is better than Tor when it comes to anonymizing your online presence, downloading torrents and sending secure email. In the same time, Tor is an excellent tool for bypassing geo-restrictions. What do you think about I2P Darknet? Do you use it? What about Tor? Let us know your thoughts in the comments below.